Preheat your oven to 375°. In the base of a stand mixer fitted with the beater attachment (or in a regular bowl, armed with a whisk and ambition), cream together the butter and sugars. Add the beaten egg and bring the mixture together into a smooth batter. Sift the flour and baking soda into a bowl and, with the mixer running on low, add that mixture to the dough until all of the flour is incorporated. Pour in the chocolate chips and fold through with a spoon. On a baking tray lined with parchment paper, add 2-tablespoon-size balls of cookie dough, leaving at least 2 inches of space between each cookie (you should have enough dough for 12 cookies). Allow the cookies to cool for 30 minutes on a rack. In the base of a stand mixer combine softened cream cheese and peanut butter, and beat on medium to cream together. Reduce the speed to low, and slowly add the sugar, about a tablespoon at a time. Add the vanilla and cream, and when the mousse starts to come together, increase the mixer speed to medium and beat for 2 minutes until creamy and smooth. Set aside. Place the chocolate in a bowl. Heat a saucepan over medium-heat, and pour in the cream. When the cream comes to a boil, pour it over the chocolate, and wait 5 minutes. Stir the melted chocolate until smooth, and add a pinch of salt. How much you use for each layer will depend on the glass size you use, and how many people you’re serving. Here is a guide to help. Build the parfaits with 1 1/2 tablespoons peanut butter mousse, 1/2 tablespoon chocolate, 1 1/2 tablespoons chocolate chip cookies, broken into pieces. Repeat as necessary. 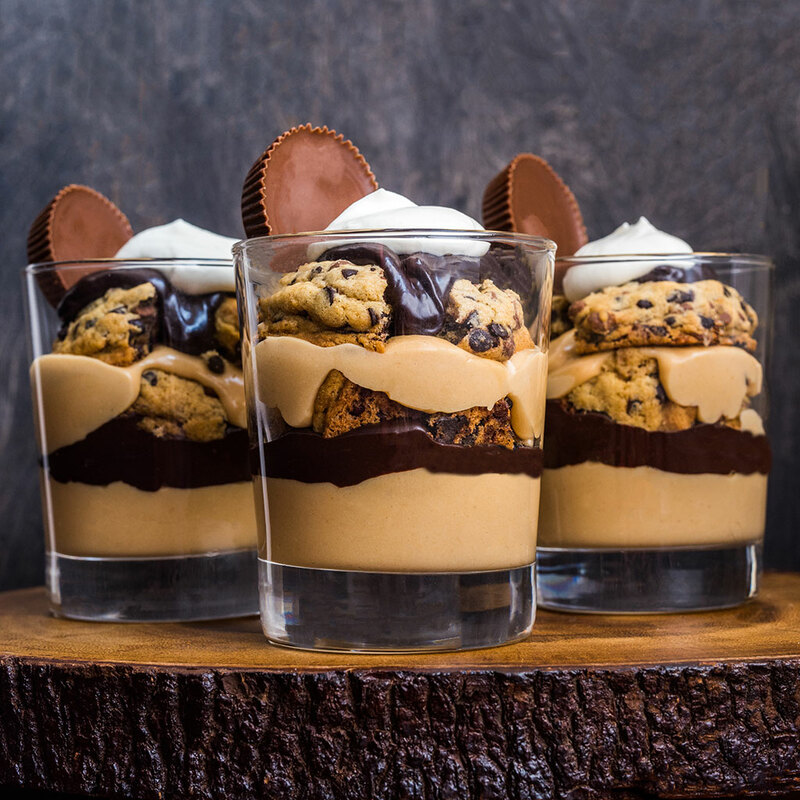 Top with 2 teaspoons whipped cream and a peanut butter cup. Who Knew Peanuts and Burgers Went So Well Together?